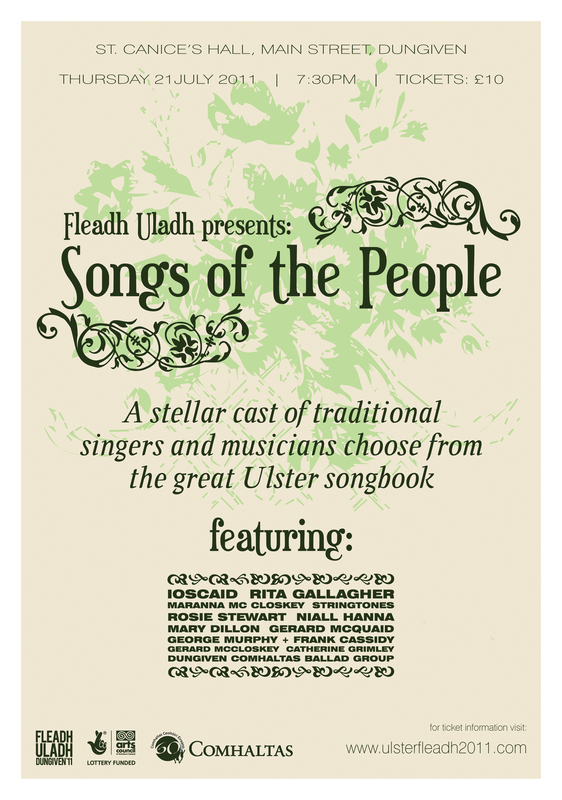 Fleadh Uladh presents: ‘Songs of the People’ – A stellar cast of traditional singers and musicians choose from the great Ulster Songbook. The concert follows on a format used in BBC Four music shows such as …Sings the Great American Songbook, whereby a host of renowned performers will choose some of their favourite songs from the Ulster singing tradition. Geordie Hanna, known to many as a great stalwart of the singing tradition. Of course, the local area itself is known as a stronghold of Irish traditional singing, and some of Dungiven’s best known singers will perform on the night. Sam Henry’s collection was originally printed as a column in County Derry newspaper the Northern Constitution between 1923 and 1939, and documents the story of Ireland - its graces and shortcomings, triumphs and sorrows – in the ballads, dirges, and humorous songs of its common people. Music is a direct and powerful expression of Irish folk culture and a beloved aspect of Irish life in the rest of the world. Comprising nearly 690 selections, Songs of the People is a record of Irish folk songs before World War II, demonstrating the historical ties between Irish and Scottish folk culture and the tremendous Irish influence on American folk music in songs from the 18th and 19th century. St. Canice’s Hall (a traditional 1920s cinema and dancehall) will be the venue for the concert, and its quaint, shabby charm will no doubt add to the nostalgic atmosphere of the night. Lynette Fay (host of the award-winning BBC series Blas Ceoil) will compere the evening, and the concert is due to be broadcast at a later date on Radio Ulster’s long-running Irish music show Folk Club. Despite the focus on singing in this concert, there is sure to be some great instrumental performances and a few surprises, with the likes of Stringtones (Brendan Hendry/Paul McSherry/Nodlaig Brolly) and upcoming Irish traditional band Ioscaid on the bill. Tickets go on sale for the event this week and are available from www.fleadhuladh.com and PANTRY Coffeehouse in Dungiven. A limited number of tickets are available, so book early to avoid disappointment. Contact the Fleadh committee at [email protected] for further details.